Dubai: The impact from the introduction of VAT will be different across GCC countries, but it will have the biggest boost on government revenues in the UAE, given its larger consumer base and importance of retail spending, especially from overseas visitors, according to BMI Research, a Fitch Group company. Saudi Arabia and the UAE are the two countries that introduced VAT as of January 1, 2018, highlighting their respective governments’ commitment to reform on the fiscal front. In 2017, Saudi Arabia and the UAE were the first countries in the GCC to introduce excise taxes on tobacco products and sugary drinks. The UAE has been a first mover in the region in terms of revenue diversification and fiscal management, having for instance started to cut utilities and fuel subsidies as early as 2015. Meanwhile, hydrocarbons accounted for 38.2 per cent of revenues in 2016 — the lowest among the GCC. “With Abu Dhabi and Dubai attracting wealthy visitors, we believe that consumers will be able to absorb higher costs. In Saudi Arabia, the fiscal impact of VAT will be lower, especially as the government introduces cash transfers to the most vulnerable households to limit the negative impact of VAT,” BMI Research said in a note. The low rate of VAT at 5 per cent suggests that widespread discontent is unlikely across UAE and Saudi Arabia. However, in Saudi Arabia, economy has been struggling in recent years — real GDP growth contracted by 0.5 per cent in 2017 with Saudi consumers having suffered the impact of subsidy cuts and fiscal austerity. Further tariffs could feed discontent. Bahrain is expected to follow the UAE and Saudi Arabia in the introduction of VAT around mid-2018, as reaffirmed by its Ministry of Finance. Bahrain is expected to follow the UAE and Saudi Arabia in the introduction of VAT around mid-2018, as reaffirmed by its Ministry of Finance. 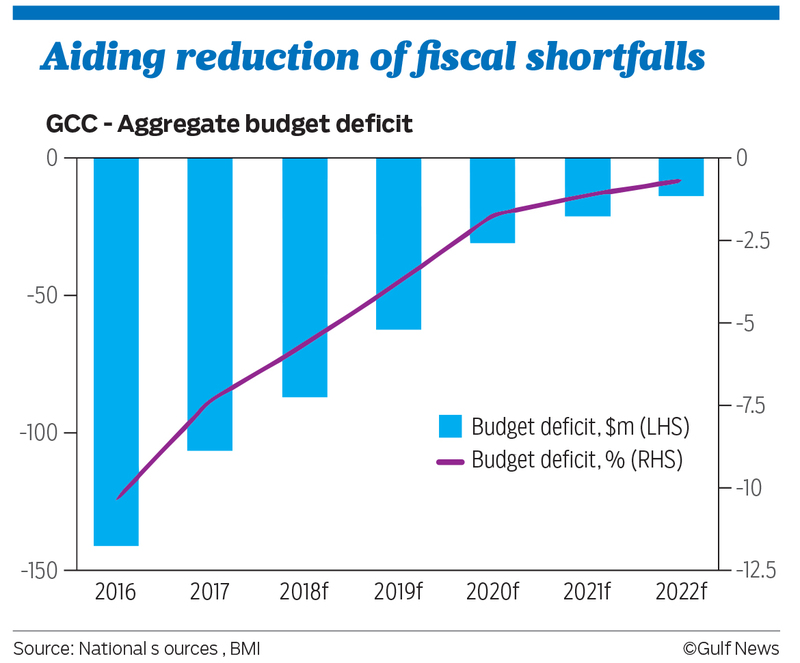 Fiscally, Bahrain is in one of the most vulnerable positions in the Gulf, with BMI forecasting a budget deficit of 10 per cent of GDP in 2018 and government debt to reach 84.5 per cent of GDP. Committing to the introduction of VAT would signal Bahrain’s efforts to put public finances on a healthier footing. Underpinning this view, the Bahraini government reaffirmed earlier in January its intention to move forward with VAT in mid-2018. Although Qatar’s implementation of VAT is delayed by political stalemate in its dispute with neighbouring countries, BMI analysts expect Qatar to move forward with the introduction of VAT, probably in the second half of 2018. Kuwait and Oman have already announced that they would postpone the introduction of VAT to 20 19, and BMI analysts said that they believe further delay is likely given limited political willingness to introduce fiscal reforms in both countries. In Kuwait, the political gridlock continues to impede economic and fiscal reforms, while the strong opposition in the popularly elected National Assembly is pushing for populist measures, limiting political cope to introduce new taxes such as VAT. Kuwait will see limited fallout from a near-term failure to introduce VAT. The country benefits from tremendous oil reserves and financial buffers, with the Kuwait Investment Authority — the country’s sovereign wealth fund — holding an estimated $524 billion worth of assets.